The partition walls for interiors made by Doal are designed to divide the areas of the house or to separate operative interiors, also of offices and work areas. The aluminium structures can be coloured as you wish and are light and versatile. The types of glass that you can use for the walls are infinite, from the transparent to the opal ones, from the satinised to the fume ones, from the reflex to the bronze ones and many more. This system perfectly matches with the modern or classical furniture because it enables you to furnish the rooms with infinite solutions and without becoming protagonist and obtaining functional areas. The partition walls can be integrated with sliding doors or single/double leaf doors following the needs and styles. For example, the cooking area can be divided from the day area, using a transparent glass as big as the entire wall, if you would like to make light penetrate or make your environment seem bigger and keeping under control the entire room. In this partition wall the transparent wall with decoration “Horizons” is realised on a glass called “Grace” with jamb in aluminium and silver. In this case the wall is needed to divide the aisle from a directional office. The decorations of Doal are directly sandblasted on glass. It is therefore possible to realise some personalised decorations following the drawing of the customer in order to make the door or the wall even more customised. 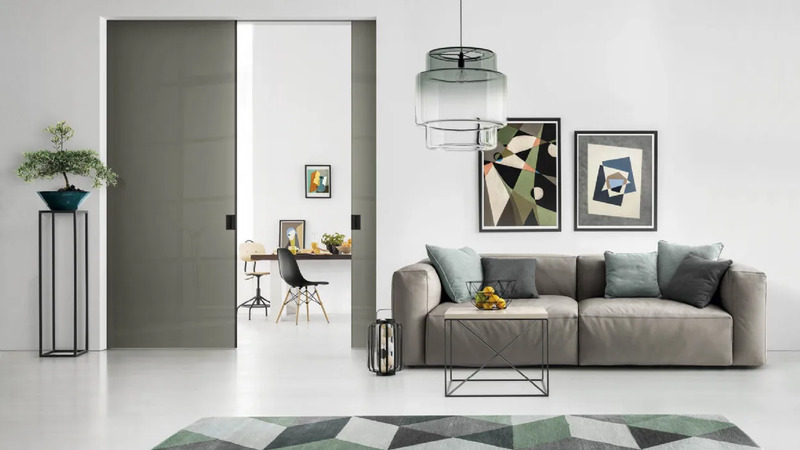 Thanks to the flexibility of the partition walls with sliding doors or leaf doors it is always possible to create and organise new areas also in the environments of your house. The maximum opportunity to personalise the systems in aluminium for interiors allows the professional or the architect to design alternative and original solutions, in order to obtain functional areas in places where before there were areas apparently less available, but with a great potential. The fixed panels can be used for long distances thanks to the juncture made of transparent polycarbonate that unifies and perfectly aligns the glass. The partition wall made of glass and aluminium “Grace” is easy to install and of design. It is suitable not only for the house but also for the office and can hold noises and ensures optimal privacy. The system of partition walls with sliding doors is an ideal design solution, practical and versatile to divide two environments in a simple way.